The Industrial Members companies of the Virtual Centre work together to provide shared leadership, visions and steering of its activities, creating opportunities and value for all. The Industrial Visions process forms a key element of this process. 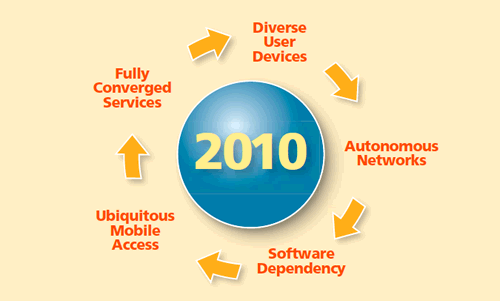 In December 2000, VCE published its "Visions of 4G" paper - which proved remarkably prescient. Much of what we see today, including the much enhanced role of software, was anticipated in that paper. Some elements remain still work in progress, delayed by the telecoms bust in the early 2000s and the more recent global banking crisis. The open approach of VCE's Industry Visions process has been key, time and again, to creating strategic insight for its members, perhaps most recently with its work on Green Radio, a term first coined by the group in 2007 and a topic whose impact has reached far beyond its member companies. [See the recently published article linked here which shows how much Green Radio activity, both short term & strategic, has been initiated across the industry since 2007]. VCE's next Strategic Vision focuses on what is needed to 'Deliver Digital' - the delivery of services using digital enablers into the physical world. Several technology themes are emerging that will play an important role in this vision, which will form a basis for internal consultation and some public discussion during 4Q2011, to prioritise activities for 2012 & beyond. In addition to research vision, VCE is also looking to identify and initiate some exploratory collaborations with application industry companies during these timescales. If interested, please make contact with us.